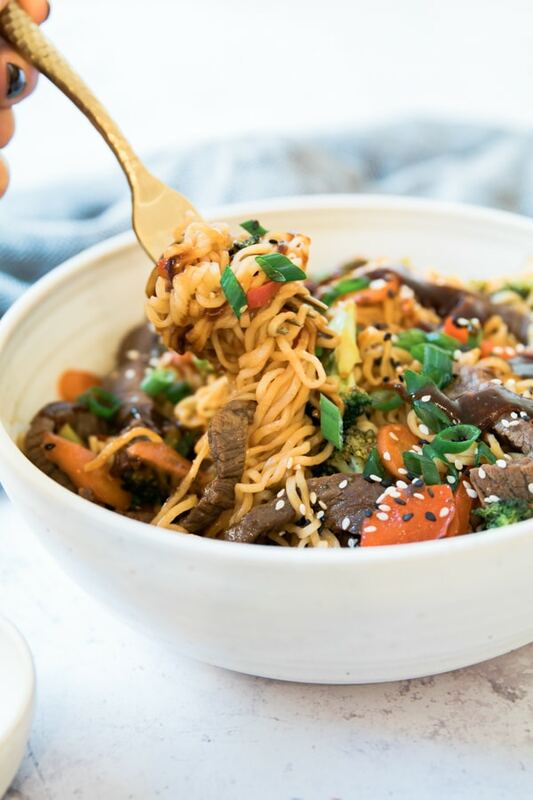 This Beef Veggie Stir-Fry is SUPER easy to make and is easy on your wallet too! One thing I enjoy about making Asian cuisine at home is being in total control of the ingredients! 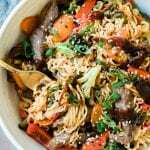 In this stir-fry dish you are able to control the sodium, type of protein (beef, chicken, shrimp, tofu), and amount of veggies you would like to add in. You might be able to find a stir-fry veggie blend at the store. If not, for this recipe I chose broccoli, carrots and red bell pepper for my vegetable options! What kind of beef do I need to buy? I prefer the pre-cut stir fry beef at the store! It cooks up nicely and is great for marinating. What type of ramen noodles should I use? This can be up for debate because I just use the top ramen noodles! (eek) They are good and do the trick! Browse the isle to find another noodles that might work best for you. This Beef Veggie Stir-Fry makes for an easy weeknight dinner recipe and full of delicious oriental flavors! Place the beef in a medium sized bowl and soak in 1 tsp. Hoisin, 2 Tbsp. soy sauce, 2 tsp. sesame, 1 tsp. oyster, 1 tsp, red pepper flakes, and 1/2 tsp. garlic powder. (Just about half of the sauce recipe). Let marinate for 5-10 minutes. Bring water to boil for the top ramen noodles. While the meat is marinating, heat the vegetable oil over medium heat and then add in prepared veggies and steak strips. Stir until veggies begin to soften and meat is fully cooked, about 8 minutes. (**You may notice liquid in your pan - drain this out if you want to get more of a stir fry effect on your veggies). Your water for the noodles should be boiling by this point, place the noodles in and cook for about 3-4 minutes, then drain. 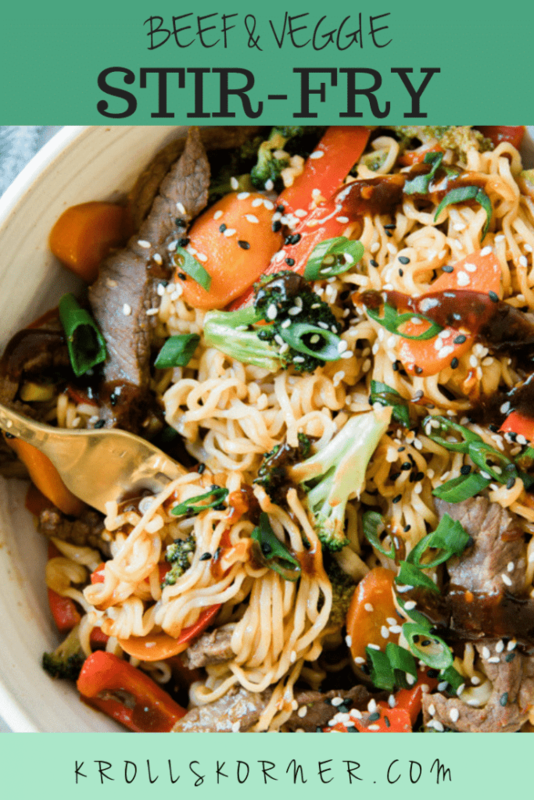 You can add the noodles in half way through stirring your meat and veggies to have everything ready at the same time! Heat remaining sauce over medium heat in a small saucepan and pour over your dish when ready to serve. Enjoy! Love this recipe?! Be sure to PIN these easy Beef and Veggie Stir-Fry for later!! I too love pre-cut stir fry beef …it makes life so much easier! This beef veggie stir fry looks delicious – the black and white sesame seeds are an especially nice touch! I love ramen noodles! Such a fun and colorful recipe using my absolute favorite. YUM! 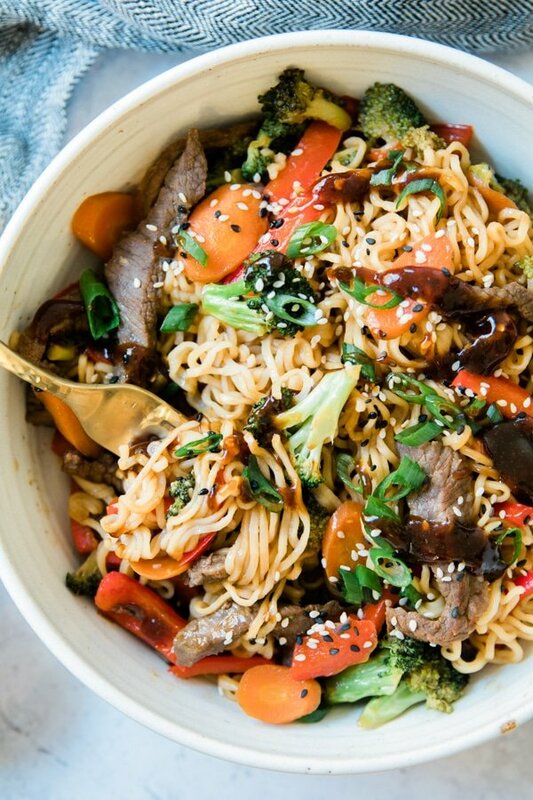 wow, this beef stir fry looks incredible, very well done and the noodles are the perfect pairing to enjoy a stir fry. My mouth is watering! This looks so flavorful! I also love how easy & cost effective it is – a few of my favorite things! Thank you so much Jillian!! Oh wow, this looks so tasty. I love easy family friendly dinners. ANd this is just that. Plus delicious! I’m saving this to give it a try next week. Yummy! Thank you so much Natalie, I hope you love it! !